For Franklin & Marshall College sophomore Nathan Miller, the research project before him is molybdenum, number 42 on the Periodic Table of Elements. More specifically, conducting experiments to figure out how molybdenum works its way into ocean sediments. 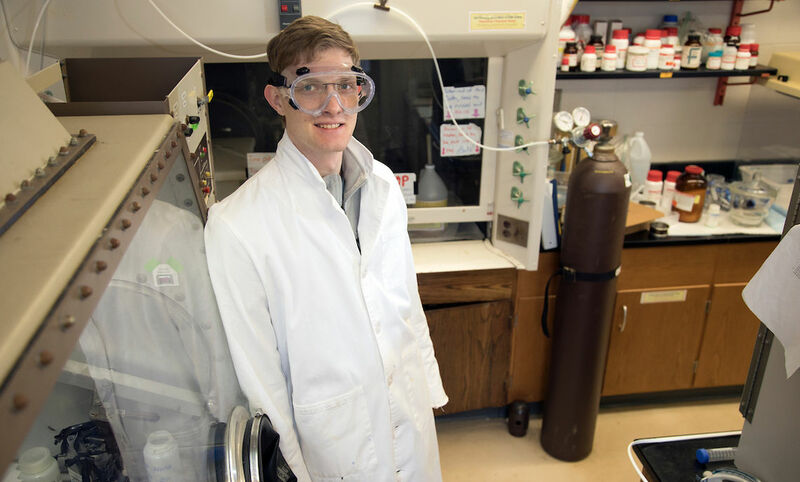 “Essentially, we try to synthesize what we hope are compounds similar to what’s in the sediment, specifically iron sulfides,” the chemistry major said. Professor of Chemistry Jennifer Morford explained that to understand how molybdenum made its way into ocean sediment is to understand changes in the marine environment. “When tree rings grow, they record to some extent the conditions that were around the tree when that part of the tree grew,” Morford said. “You can tell things like changes in precipitation by looking at each tree ring. Marine sediments accumulate in the same way, and as marine sediments accumulate, they’re telling us something about past conditions. Since marine environments are messy and complicated, work is done in the lab, where Miller made a few hundred milligrams of particles with different amounts of molybdenum, iron and sulphur. Last summer, using instrumentation at the Penn State Materials Characterization Lab in State College, Miller studied his synthesized particles to look at the different interactions between molybdenum, iron and sulfide. Morford said they suspect iron molybdenum-sulfide-minerals might be occurring on the nanoscale. For Miller, the hands-on research experience has him considering graduate school.